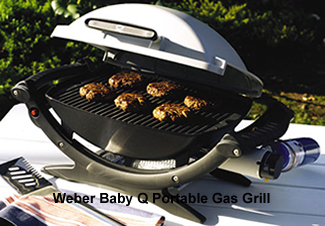 <?xml version="1.0" encoding="UTF-8"> Portable Gas Grills For Camping - Which One Is Best? Portable Gas Grills For Camping - Which One Is Best? Not that long ago, if you wanted to purchase a portable gas grill you went to your local retailer and had one or, sometimes two, choices. Not anymore. Now there are a lot of portable gas grills on the market, with prices ranging from less than $30 for a basic model to $500 for a high end model. How do you choose? This is what I've learned. First of all, how often are you going to be using the grill? If you're not going to be using one very often it doesn't pay to spend a lot of money on one. We bought our first portable gas grill for camping 4 years ago and got it for $19.99 on sale. It worked okay. The biggest problem with it was temperature control - it always cooked on high. But because we didn't cook a whole lot more than burgers and brats on it, it worked for us. It also only lasted one year, so the next year we spent $23.99 to replace it. That one lasted until the end of last year. This year, however, I decided I wanted something a little better because we use a gas grill quite often when camping and I wanted to be able to control the heat a little better so I could cook things like chicken without having it charred to a crisp on the outside in order to not have it raw inside. After some research and talks with people who already owned gas grills, we purchased a Weber Baby-Q for around $120. I really like it. We have good temperature control, it cooks evenly, and it's easy to clean up. On the negative side, it's pretty heavy - 29 pounds. I wouldn't want to carry it very far. You need two hands to carry it because the carrying handles are on both sides of the grill. Also, if you want a stand for it you have to purchase it separately. 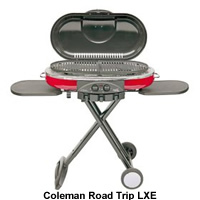 Another grill we looked at closely and one that we see a lot at tailgating parties is the Coleman Road Trip. My brother and sister-in-law purchased one two years ago. While they like it's portability (it folds up neatly for transporting) and how evenly it cooks, they hate cleaning it up - so much so that they hardly ever use it anymore. For that reason alone I didn't purchase it. I thought the price was a little high too - it's currently selling for around $160 on Amazon. There are other portable gas grills on the market. If you feel like shelling out $500, you can get Outdoor Concepts 100% stainless steel one. Shop around before purchasing a gas grill and don't be afraid to stop and chat with people you see using one you're considering. Most people are more than happy to tell you the pros and cons of the grill they own.